Dennis, Say It Isn’t So! 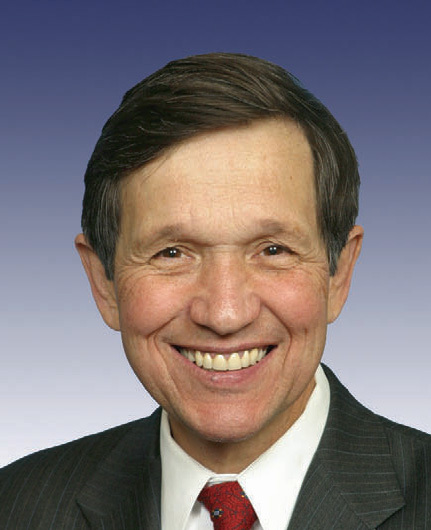 Ohio's liberal Democrat Dennis Kucinich makes major switch to Yes vote on Obamacare. “After careful discussions with the President and Speaker Pelosi,” Dennis Kucinich explained, “I’ve decided to cast a vote in favor of the legislation” thereby pretty much sealing the deal for Obama care. The Ohio Democrat, who is as liberal as they get, spells a key victory for Obama who rode Kucinich aboard Air Force One on Monday for a town hall in Ohio. Kucinich had been opposed to Obamacare because it contained no strong public option; he has been, and still is, an advocate for single-payer universal healthcare similar to European models. Saying that “I do not retract those criticisms, I have doubts about the bill,” Kucinich explained that “the President’s visit to my district underscored the urgency” of the healthcare crisis. Kucinich’s district in the Cleveland area has been hit very hard economically; his district office, he said doubles as a “social service” center where he intervenes to help constituents who have become unemployed and lost their healthcare. “I understand the connection between poverty and healthcare…Health and healthcare is personal for each one of us,” Kucinich said defending his change of heart. It will be interesting to watch how this affects Kucinich, his political career, his district, and Ohio in general. Wonder what Obama really offered him aboard the Presidential plane? It appears that the plan by President Obama and Speaker Nancy Pelosi to ram the Senate’s version of ObamaCare through the Democrat-majority House is falling apart just one day after Obama commanded Democrats to get it done. In addition to “dozens” of Democrats who object to the latest Obamacare because of its lack of solid anti-abortion language, Democratic Congressman Dennis Kucinich, the liberally-minded representative from Ohio, says he will vote “no” if the bill comes to the House floor, according to Fox News. Congressman Bart Stupak (D – Michigan) and several other House Democrats already have said that they will vote no if and when the Senate version comes to the House floor. Stupak co-authored, along with Representative Joe Pitts (R – Pennsylvania) the “Stupak Amendment” in the earlier House version which prohibited, in clear language, the use of Federal funds to perform abortions. Obamacare passed the House only because that language was in it. The Senate, on the other hand, namely Leader Harry Reid (D – Nevada), removed the Stupak Amendment which has become an issue of contention now between both houses of Congress. Majority Leader Steny Hoyer (D – Maryland) has been trying to reassure House Dems that the bill still will prohibit federal dollars from going to abortions, but House members aren’t buying it. Their qualms about the Senate version have validity, especially after the President laid out his personal preferences for h.c. reform, agreeing with the Senate bill, which allows Federal funding for women’s community healthcare clinics which often perform abortions. I received this email from Representative Dennis Kucinich (D – Ohio). The contents of Kucinich’s message (below) spell out clearly why a rush to judgment – when it comes to whether or not we go to war, or stay in one – can have dire consequences. The Bush Administration used whatever tactics were necessary to rush this country into war on two fronts. They had no plan, no strategy, and, in the case of Afghanistan, did not finish the job there before getting us involved with Iraq. Now, nearly a decade later, we are still trying to resolve the mess created by those reckless decisions of the previous Administration. Rather than repeating the same mistakes, Obama is taking time to make an informed decision regarding Afghanistan by discussing possible solutions with everyone involved including the commanders in the field. He will, after hearing from all sides, make a decision, and probably a tough one; this is the President’s job – to make the hard choices. Obama’s approach is more intelligent than Bush’s hectic utilization of troops and treasure. But those with vested interests in continuing this war, at the expense of the lives of American soldiers and of our economy, want to steer public opinion away from a President who thinks things through. Let’s give President Obama a chance to get this country out of this mess. For the sake of our soldiers, and all future soldiers, let’s all practice some patience and give Obama this time to make, God willing, the right choices. Download, print and circulate the petition among friends and neighbors. Seven years ago this week the House of Representatives debated the Iraq War Resolution which was presented by President Bush. I made the case for NOT going to war. I analyzed the Bush war resolution, paragraph by paragraph, and pointed out "Key Issues" which argued against Congress voting to go to war. I distributed the attached analysis, personally, to over 200 members of Congress from October 2, 2002 until October 10, 2002 when the vote occurred. When you hear people say: "If only we had known then what we know now," remember, some did know of the false case for war against Iraq. And since so many know now that we should not have gone to war against Iraq, then why are we still there? Please read this analysis and let me know what you think. P.S. – The "Whereas" clauses were verbatim from the 2003 Bush Iraq War Resolution. The "Key Issue" represented my commentary. KEY ISSUE: In the Persian Gulf War there was an international coalition. World support was for protecting Kuwait. There is no world support for invading Iraq. KEY ISSUE: UN inspection teams identified and destroyed nearly all such weapons. A lead inspector, Scott Ritter, said that he believes that nearly all other weapons not found were destroyed in the Gulf War. Furthermore, according to a published report in the Washington Post, the Central Intelligence Agency has no up to date accurate report on Iraq’s WMD capabilities. KEY ISSUE: Iraqi deceptions always failed. The inspectors always figured out what Iraq was doing. It was the United States that withdrew from the inspections in 1998. And the United States then launched a cruise missile attack against Iraq 48 hours after the inspectors left. In advance of a military strike, the US continues to thwart (the Administration’s word) weapons inspections. KEY ISSUE: There is no proof that Iraq represents an imminent or immediate threat to the United States. A "continuing" threat does not constitute a sufficient cause for war. The Administration has refused to provide the Congress with credible intelligence that proves that Iraq is a serious threat to the United States and is continuing to possess and develop chemical and biological and nuclear weapons. Furthermore there is no credible intelligence connecting Iraq to Al Qaida and 9/11. KEY ISSUE: This language is so broad that it would allow the President to order an attack against Iraq even when there is no material threat to the United States. Since this resolution authorizes the use of force for all Iraq related violations of the UN Security Council directives, and since the resolution cites Iraq’s imprisonment of non-Iraqi prisoners, this resolution would authorize the President to attack Iraq in order to liberate Kuwaiti citizens who may or may not be in Iraqi prisons, even if Iraq met compliance with all requests to destroy any weapons of mass destruction. Though in 2002 at the Arab Summit, Iraq and Kuwait agreed to bilateral negotiations to work out all claims relating to stolen property and prisoners of war. This use-of-force resolution enables the President to commit US troops to recover Kuwaiti property. KEY ISSUE: The Iraqi regime has never attacked nor does it have the capability to attack the United States. The "no fly" zone was not the result of a UN Security Council directive. It was illegally imposed by the United States, Great Britain and France and is not specifically sanctioned by any Security Council resolution. KEY ISSUE: There is no credible intelligence that connects Iraq to the events of 9/11 or to participation in those events by assisting Al Qaida. KEY ISSUE: Any connection between Iraq support of terrorist groups in the Middle East, is an argument for focusing great resources on resolving the conflict between Israel and the Palestinians. It is not sufficient reason for the US to launch a unilateral preemptive strike against Iraq. KEY ISSUE: There is no connection between Iraq and the events of 9/11. KEY ISSUE: There is no credible evidence that Iraq possesses weapons of mass destruction. If Iraq has successfully concealed the production of such weapons since 1998, there is no credible evidence that Iraq has the capability to reach the United States with such weapons. In the 1991 Gulf War, Iraq had a demonstrated capability of biological and chemical weapons, but did not have the willingness to use them against the United States Armed Forces. Congress has not been provided with any credible information, which proves that Iraq has provided international terrorists with weapons of mass destruction. KEY ISSUE: The UN Charter forbids all member nations, including the United States, from unilaterally enforcing UN resolutions. KEY ISSUE: The UN Charter forbids all member nations, including the United States, from unilaterally enforcing UN resolutions with military force. KEY ISSUE: This clause demonstrates the proper chronology of the international process, and contrasts the current march to war. In 1991, the UN Security Council passed a resolution asking for enforcement of its resolution. Member countries authorized their troops to participate in a UN-led coalition to enforce the UN resolutions. Now the President is asking Congress to authorize a unilateral first strike before the UN Security Council has asked its member states to enforce UN resolutions. KEY ISSUE: This "Sense of Congress" resolution was not binding. Furthermore, while Congress supported democratic means of removing Saddam Hussein it clearly did not endorse the use of force contemplated in this resolution, nor did it endorse assassination as a policy.